PG-C-100 Cast Iron Heavy Duty Pipe Grabs - 1,000 Load Limit - Pipe O.D. 6.63" to 6.9"
PG-C-140 Cast Iron Heavy Duty Pipe Grabs - 1,400 Load Limit - Pipe O.D. 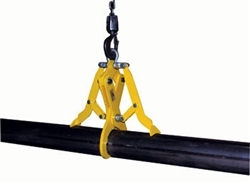 8.63" to 9.05"
PG-C-200 Cast Iron Heavy Duty Pipe Grabs - 2,000 Load Limit - Pipe O.D. 10.75" to 11.1"